As noted in other pages on Philly H2O (in particular see the "Creek to Sewer" link to the left), an extraordinary amount of cutting and filling of land has been done in Philadelphia, from the beginning of settlement in the 1680s and continuing to the present day. In most areas, the fill provided a solid base for the houses built on top of it. Unfortunately, a few places in the city were built on inadequate fill, either too loose in composition or not sufficiently compacted before construction. The Logan neighborhood, in the vicinity of 9th Street and Roosevelt. Boulevard, is by far the worst example. 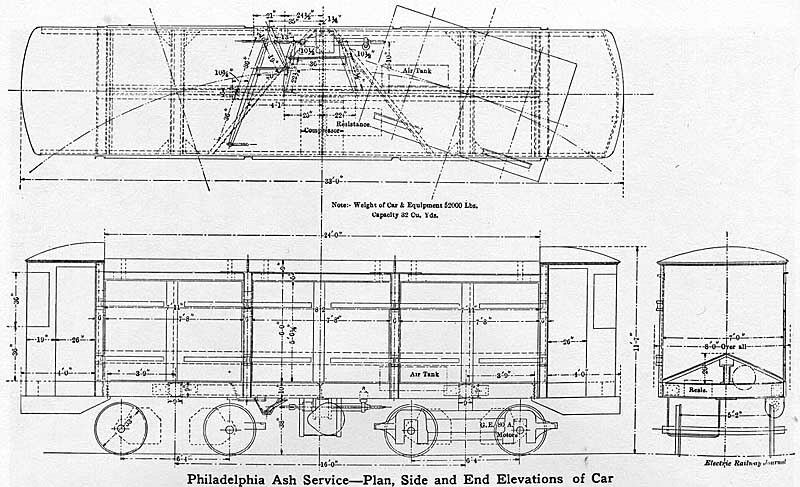 The ash had been been carted to Logan by special trolleys operated by the Philadelphia Rapid Transit Co., as explained in the following excerpt from Harold Cox's book, Utility Cars of Philadelphia, which he has kindly allowed given me permission to use, along with accompanying diagrams and photographs. Mr. Cox's many books on trolley systems in Philadelphia and elsewhere are now out of print. To view one of his current interests -- Pennsylvania election statistics, beginning with the state's first elections in 1682 and continuing to the present -- visit his website, http://staffweb.wilkes.edu/harold.cox/index.html. 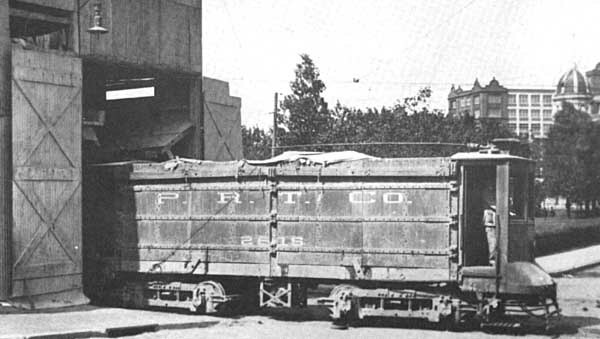 [PAGE 76] One of the more interesting services operated by PRT was the ash hauling which began in 1908. This was the first contract hauling regularly done by PRT, other than mail and newspapers, and appears to have come about through local politics. One of the perennial problem areas of the sordid Philadelphia political scene in the early 1900's was the construction of suburban boulevards, particularly the Southern Boulevard, now known as Broad St., and the Torresdale Boulevard, which became Roosevelt Blvd. In 1906, the financial house of Wolf Brothers bought about 80 acres of land on the Torresdale Boulevard in the vicinity of what is now 9th St. At this point the boulevard had been built up on an embankment to carry it across the Wingohocking Creek and the North Penn Railroad and the land was as much as forty feet below grade, a condition which did little to improve its value. It was estimated that it would take about 500,000 cubic yards of material to fill the depression at a cost of about $425,000. The new owner, Clarence Wolf, however had other ideas. Wolf was the financial advisor to Mayor Reyburn and by 1908 became one of the representatives to which the city was entitled on the board of directors of PRT. He was, moreover, a heavy stockholder in the company and later its vice president. In those days, Edwin Vare, another local political figure, inevitably secured the contract for hauling rubbish and ashes from the central district which covered Philadelphia from South to Green Street and from the Delaware to the Schuylkill River. This was hauled by wagon to South Philadelphia where the Vare [PAGE 78] Brothers were building the Southern Boulevard. 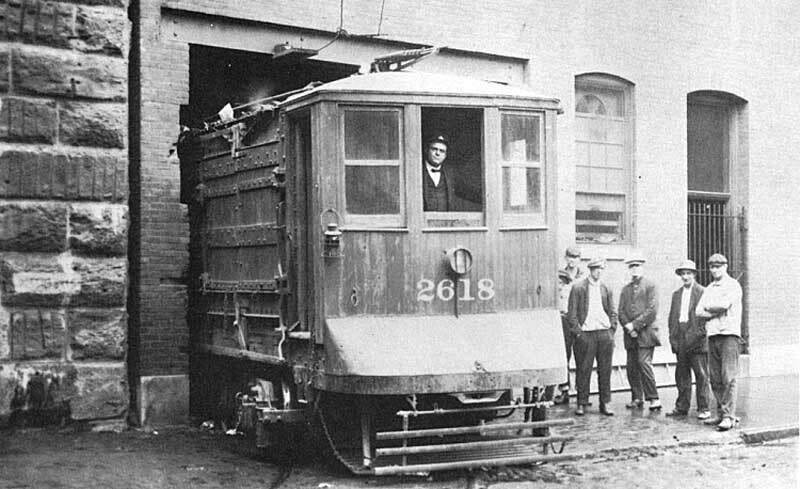 In 1907, apparently at the instigation of William Benson, Chief of the Bureau of Highways and Street Cleaning for the city and George Stearns, Director of Public Works, it was ruled that in the future rubbish and ashes picked up in the central district had to be hauled away by trolley rather than wagon to outlying dumps. It might be noted that both Benson and Stearns had previously worked for Clarence Wolf. Under this requirement, Vare received the contract and in turn paid PRT $10,861.11 a month to do the hauling. In addition, he had to pay half the cost of building the cars at $5,500 each, a price which seems a bit high. Curiously enough the dump used by PRT was the Wolf lands on the Boulevard. The Philadelphia Record also found it curious that the dump caught fire at frequent intervals and the city fire department was called out to douse the blaze and, incidentally, to help compact the fill. It also thought that the decision of the city to open 9th Street through the middle of the lands in question was one coincidence too many. Whatever the background, PRT was now in the rubbish business. It built eight cars for the service, of which seven were in regular use and one was a spare. They were huge open-top cars. The first were equipped with doors which were hinged at the top and swung upward with chains. The later design used swinging wooden doors held in place by large wooden bars. The floors of the cars were twenty inches higher in the center than on the sides, an arrangement which allowed the refuse to flow out of the car when the doors were open. This placed pressure on the doors and if the bars worked loose, the cars dumped part or all of their cargo. On at least one occasion, an unwary wagoner was inundated in debris by a passing car. The cars were built at either 8th St. or Kensington. Company records erroneously showed them for years as having been made by Brill. They were numbered 2616 to 2623. Service in the center-city district which was known as District Two, began on 1 April 1908. The following year, PRT also began hauling from District Three, also under a sub-contract from Vare. This district covered the area bounded by Poplar St., Broad St., Lehigh Ave., and the Schuylkill River. The service here began on 1 April 1909. The rate charged was now $107,500 a year for District 2 and $105,000 for District 3. The larger territory required more cars. Six, identical with the original group, were bought from Brill. Four of these were ordered in October 1909 on Brill order 16827 and were numbered 2612 to 2615. Two more were ordered in April 1910 on Brill order 17062 and numbered 2610 and 2611. Originally the refuse was loaded at a corrugated-iron building at 15th and Wood Streets. A branch track was built up Wood St. - and through the building. Later the loading point was moved to an old brick building on Race Street east of 12th with an access track running up Quarry Street to the rear of the building and through to Race. For District 3, [PAGE 80] an iron loading shed was built on Sedgley Ave. near Lehigh. Refuse wagons were driven up ramps to the second floors of the buildings and dumped into the waiting cars below through chutes. A tow rope was used to help the horses pull the heavy wagons up the inclines to the upper level. While the presumed purpose of the trolley operation was to cut down on the wagon traffic, the cars seemed to be a bigger nuisance than the one replaced. In the beginning the cars traveled in pairs leaving the dumping house about every half hour from 7:30 A.M. They averaged four to five trips a day for each car and ran from eight to twelve hours. There are many recorded protests to the movement of the cars during rush hours. Efforts to run them at night made people who objected to the noise made by the monsters as well as the debris which was left in their wake, no happier. The dump was equipped with temporary track and bracket trolley which was shifted around from place to place as the work progressed. The contract indicates that Vare had to bear the cost of track shifting. Besides the Torresdale Boulevard site, the cars were later used to fill in Southern Blvd. particularly around Hartranft Street, an imaginary thoroughfare about where the Naval Hospital now stands. This was a marsh owned by PRT which they proposed from time to time to use as a new car barn site. A dump somewhere on Passyunk Avenue was also used. Two more ash cars were bought from Brill on order 17705 in June 1911 and numbered 5614 and 5615. The numbers from 5600 to 5613 were reserved for the fourteen ash cars already on the property but they were never renumbered into this series. In 1912, Mitten changed his mind about the system of numbering utility equipment and the whole group was renumbered as P-l to P-16. The last purchase of cars was a bit premature. In 1912, Vare went back to hauling District 3 refuse entirely by wagon and the cars were rendered surplus. In 1913, six had their sides cut down and were transferred to the Roadway Dept. where they were used in the construction of the Callowhill Depot. For the details of this unusual operation, see under Class W.
The District 2 contracts ran through 1914 and a day-by-day arrangement used from 1 January 1915 until 16 January 1915 when Vare apparently converted exclusively to wagons. Three additional cars were converted for other uses in 1916 when their bodies were removed to the floor framing and express bodies built in their place. They were renumbered F-23 to 25. This work was done by PRT in its own shops. The ash hauling was revived during 1917 in District 3. The Sedgeley St. dump house had apparently been abandoned by then and the debris was hauled to the Race St. building where it was loaded onto the cars and taken to the eastern portion of League Island Park where it was used for fill. The contract was signed during January 1917 but it took the company some little time to get the sidings installed and the cars back into service due to the shortages brought on by preparations for World War I. This time the cars were hired by the hour at $2.50. The company was protected by a ten-hour minimum for any car put into service, an arrangement which caused Senator Vare some problems. The cars had to use the League Island line which also served the Navy Yard and the congestion forced the cars to operate less than 10 hours. The 10-hour clause was eliminated in April 1918 and the contract terminated on 15 June 1918, apparently as a result of the park land having been filled. PRT also did some contractual hauling of ashes for private firms but this service was terminated before 1918. It also used the cars to move ashes from the power plants. The seven remaining ash cars were kept on the property until 1922 when all but P-16 were scrapped. 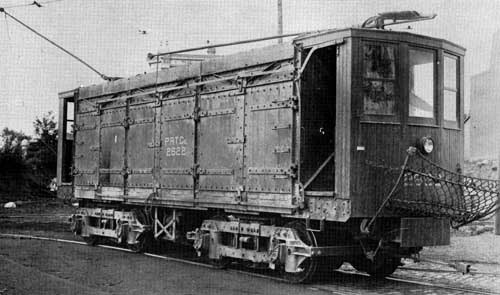 P-16 was used by Kensington Shop to use as a depot supply car, a job it retained for another thirty years. PHOTO p. 76: Ash car 2618, later P-9 and W-29, PRT, 1908, Curtis C-1112 trucks. View taken January 1909 on Race St. at Marvine. The large stone structure to the left is the abutment for the Reading Railroad. Note that the doorway has been broken out to conform to the projections on the car. The cars entered Quarry St., a narrow alley below Race, then ran through the building and out into Race Street. PHOTO, p. 77 top: Ash car 2622, later P-13 and W-31, PRT, 1908, Curtis C-1112 trucks. View taken 20 May 1908, probably at Wyoming Avenue Power House. Note how the problem of how to hold down the trolley pole has been solved. PHOTO, p. 77 bottom: Somewhere under all that mess are tracks. 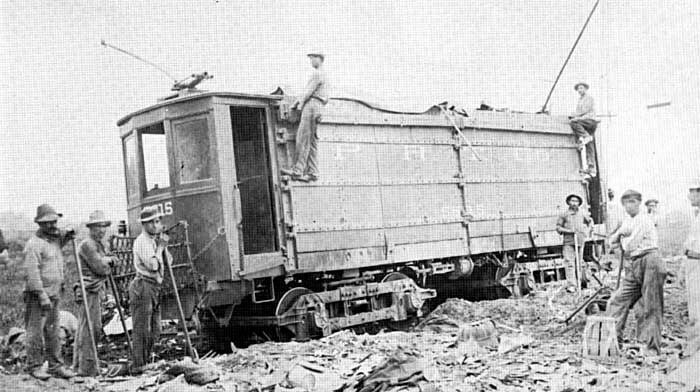 Car 5615, later P-16 and the second D-31, Brill, 1911, Curtis C-1112 trucks prepares to unload debris at one of the dumps. This is believed to be at South Broad and Hoyt where the Naval Hospital now stands. Note the happy workmen and the trolley poles tied off at right angles away from the wire. Picture taken on 4 August 1911. PHOTO p. 79 top: The second floor of the original ash dumping house at 15th & Wood Sts., showing the manner in which the wagons were emptied through chutes into the cars below. St. Ry. Journal. PHOTO p. 79 bottom: Below: Car 2615, Brill, 1909, Brill Curtis trucks. This ash house was at the corner of Margie St. and Sedgley Ave. The dome to the right rear is the office of Connie Mack on top of Shibe Park at the corner of 21st & Lehigh. View taken 20 September 1912.